A proposal at the Capitol would restore the civil rights of state and UW employees. 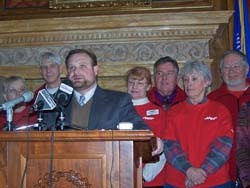 U.S. Supreme Court decisions over the last decade have resulted in nearly 60,000 state employees being denied key civil rights protections, according to state Representative Cory Mason (D-Racine). He says those decisions have impacted the rights of workers to sue the state under the Family Medical Leave Act, Fair Labor Standards Act, Age Discrimination Employment Act, and the Americans with Disabilities Act. Mason is introducing legislation requiring the state to waive its immunity to those laws. As a major employer, he says the state should not tolerate people being denied the right to protect themselves from discrimination or wrongful termination from a job. The exemption from federal law does not apply to local government employees, only those directly employed by the state. Mason says it&apos;s unfair to prevent those workers from suing the state, if they feel federal laws have been violated. A similar proposal failed to pass during the last legislative session.